As gamification literature has matured, the gap between how different domains apply the theory has widened. This has positioned gamification as being more dependent on context, rather than being an independent theory per se. To address this notion, three concepts are identified as being central for how a gamificator, the one responsible for gamifying, gamifies a process. These are mechanics, mental mediators and desired outcomes. Following this logic, a review was conducted using 77 (n) articles across seven disciplines, namely health and wellness, crowdsourcing, sustainability, computer science, software development, business, and tourism. The findings highlighted potentially causal and correlational relationships between several concepts when gamifying a situation, context, service or/and process. This research presents an alternative and uniform perspective on the broad gamification research to better understand how gamification functions and can be employed to impact various outcomes. Furthermore, this research contributes to this rather eclectic domain, presenting a more categorized view in showing domain-specific mechanics and how these can be employed for empirical testing. 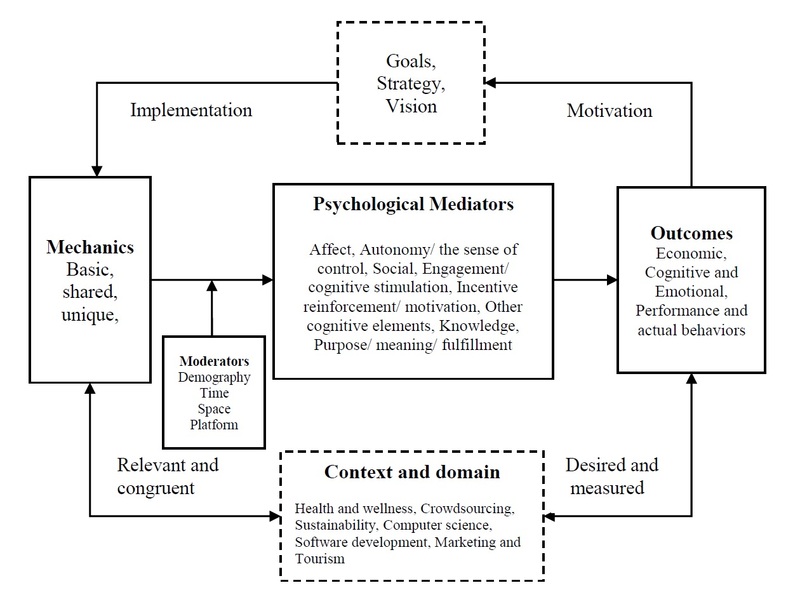 Lastly, the conceptual model can be modified, employed and adjusted to investigate various effects of gamification on outcomes.